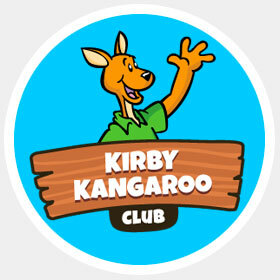 Hi kids, welcome to the Kirby Kangaroo Club website. This Club is only for members of your credit union! We will be going on great adventures with Kirby as he teaches us how to save money and we explore more about the Credit Union and exactly how it works. Watch for more information on events that we will be having at the Credit Union. You will have a chance to earn Kirby bucks to use at the store here at the Credit Union. For every deposit of at least $2.50 you will earn 1 Kirby buck. You can also save your Kirby bucks for upcoming drawings or for prizes that require more Kirby bucks. The link above will open as a PDF in a new window. If you have trouble opening the file you can download the free Adobe Reader by clicking the button. With $100 minimum deposit, Kirby members earn dividends. Access the Club website for stories, games, coloring pages and jokes to entertain and educate. Fun games and financial lessons for all to enjoy are available in every issue. When your child turns 13, their account automatically rolls over into our teen-oriented CU Succeed program.